Drawing on her Mexican-American and Cherokee heritage and experience as a music ministry leader, Donna Peña composes music that is ideal for multilingual worship. Her bilingual psalmody expresses ethnic richness in an accessible manner. Sigan la Bandera (Follow the Banner) is a musical celebration of Mary, who appeared to St. Juan Diego as the Virgin of Guadalupe in 1531, and who continues to inspire and intercede for the people of Mexico, the Americas and all who seek her help. For centuries, pilgrims have "followed" and made processions to her "banner," the cloth from Juan's cloak on which her image miraculously appeared. These 12 new and traditional Marian songs will delight all who love the mariachi music of Mexico and all who have a special devotion to "la morenita." Expertly performed by the ensemble Mariachi Tepeyac, with Donna on vocals and flute, Sigan la Bandera captures all the color and mystique of this spirited music. Besides seven beloved, traditional songs, the collection includes two new compositions by Donna. "There is truly nothing like it"
"There is no greater pride in Mexico than the look of the charro," she explains, "and the sound of the violins, trumpets, guitars, guitarron and vihuela that make up the mariachi. With the opening statements of these instruments, one hears the gritos and roars of approval by those who come to listen. There is truly nothing like it." "Mi Virgen Ranchera" is a very popular song by the famous Mexican composer Chucho Monje. "Virgen Mambisa" is a flamboyant song by Cuban nationals Rogelio Zelada and Orlando Rodríguez of Miami. Many will also recognize "Santa María del Camino," a well-known song by Spanish composer Juan Antonio Espinosa. Donna composed "Ruega por Nosotros" to express gratitude to Mary, who is with us-and one of us-in the midst of all our struggles. A medley combining a traditional song with a something Donna learned from the Mexican community growing up in Minnesota, "El Adiós de un Soldado/Adiós, O Virgen de Guadalupe" is a touching remembrance of young people leaving for war. Of course, the music of Sigan la Bandera will be especially meaningful on December 12, the feast of Our Lady of Guadalupe; it can create a "Mañanitas" experience for that celebration. But these mariachi serenades in honor of Mary make delightful listening any time of the year. 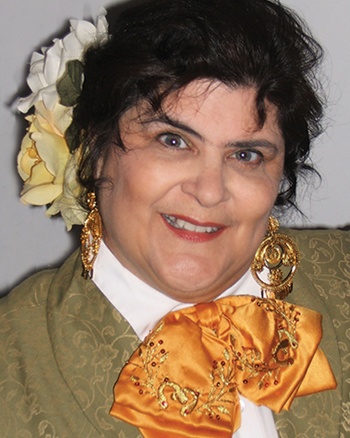 Donna Peña grew up in St. Paul, Minnesota, and studied at the University of Minnesota. She served for many years as music director at Our Lady of Guadalupe Catholic Church in St. Paul. Donna’s bilingual music, which expresses ethnic richness in an accessible manner, can be found in the two-volume Cantaré Eternamente/For Ever I Will Sing. Her collection Sigan la Bandera is a musical celebration of Mary with Donna on vocals and flute. Donna lives in Inver Grove Heights, Minnesota.